Marvel has been steadily releasing miniseries pitting Deadpool against various characters for the last few years—including two books where he kills the entire Marvel Universe—so it was only a matter of time until the Merc With A Mouth faced off against the grizzled future version of Wolverine. 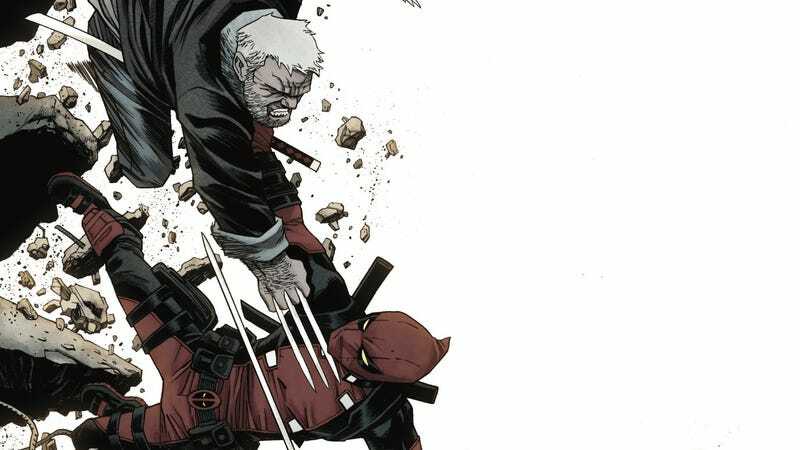 As the two most prominent solo heroes of Fox’s X-Men film franchise, Deadpool and Old Man Logan were bound to beat the crap out of each other on the comics page, and that’s exactly what Deadpool Vs. Old Man Logan delivers. Written by Declan Shalvey with art by Mike Henderson and colorist Lee Loughridge, this miniseries is driven by intense action, and the creative team understands that the main appeal of a vs. book is showing how the characters’ individual skills make them formidable fighters. The first issue of Deadpool Vs. Old Man Logan began with a delightfully madcap sequence spotlighting the book’s sense of humor, and how the creative team uses panel composition and layout to reinforce the comedy. Violence is once again at the forefront in this exclusive preview of next week’s Deadpool Vs. Old Man Logan #2, but Shalvey has introduced some higher stakes as the heroes try to protect a new mutant being hunted by a corrupt weapons manufacturer. They may have the same goal, but the two men are still antagonistic toward each other, and Deadpool is only helping the girl because he knows it will piss off Logan. Mike Henderson has done exceptional work on books like Nailbiter and Masks And Mobsters, and Shalvey is spotlighting his collaborator’s talent with his scripts for Deadpool Vs. Old Man Logan. Comic timing is essential for any Deadpool story, and the zany energy of Shalvey’s characterization gives Henderson the freedom to go big with how he presents Deadpool in action. Lee Loughridge’s coloring has strong palettes that set the atmosphere for different scenes, and his minimalist rendering keeps the eye on Henderson’s crisp, dynamic linework. The violence in the first page of this preview hits harder because of the almost black-and-white coloring, emphasizing the stark brutality of Deadpool and Logan when they let loose.